Lindsay Lohan Sent To Jail For Probation Violation. Again. Bails Out. Again. I feel like I’ve written this post before. A couple of times. I wonder if Lindsay Lohan is as sick of all of this as we are? Probably not, seeing how she seems to be incapable of keeping her nose clean. So in the latest Lilo trials and tribulations, the law-challenged actress has had her felony grand theft charge reduced to a misdemeanor, which is an incredibly lucky break. Noting that Lindsay Lohan’s DUI conviction was four years ago, Judge Stephanie Sautner ruled that the offense – as well as Lindsay’s record – did not support a felony charge. But the good news didn’t last long. You see, Lindsay’s been under the confines of this little thing called probation. And, well, the alleged theft of the necklace is a blatant violation of its terms. While Judge Sautner may not feel the alleged theft is enough to warrant a felony charge, she certainly thinks Lindsay should be punished for the probation violation, and sentenced Lohan to 120 days in county jail. Unfortunately, the term “punished” is being used loosely here. Lindsay [was] remanded into custody and taken to the basement of the courthouse for booking. Lindsay’s lawyer has said she’ll appeal, which means Lindsay is entitled to post bail. Lohan was also ordered to complete 480 hours of community service — 360 of those hours must be performed at the Downtown Women’s Center, so Lindsay can see how needy women have to live. The remaining 120 hours will be served at the L.A. County morgue. About five hours after being booked into Lynwood Correctional Facility – and having her fifth mug shot taken – Lindsay Lohan’s $75,000 bail was posted; sending her once again through the exit doors and free to roam the streets. She is due back in court on May 11th for her pretrial hearing. 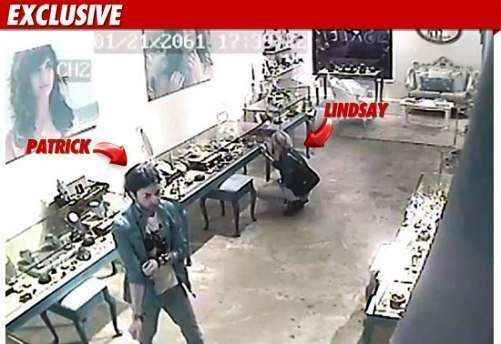 It’s important to note that although the Judge reduced Lindsay’s charges from a felony to a misdemeanor, she did not throw out the case, and there are still theft charges on the table that could spell big trouble for our Miss Lindsay. Judge Sautner explained that Lindsay should have called the store and notified the owners about the necklace sooner. She waited several weeks and returned the necklace after finding out the cops were about to raid her house. Sautner seemed influenced by the surveillance video, which she saw for the first time in court today. Sautner agreed with Danette Meyers, who argued Lindsay used her friend Patrick as a decoy to distract the clerk. 50 queries in 0.624 seconds.